While HootSuite is the social media tool of choice for many huge enterprises, governments, and NGO/NPOs, even more users are running small and medium businesses. The venerable Wall Street Journal asked for a few names of SMBs using HootSuite to discuss the results of the social media campaigns for increasing sales and building culture. Our suggestions included the exceptionally hip shoemaker based in Vancouver, John Fluevog – known for their mix of urban sophistication, old world craftsmanship and artful whimsy as well as razor smart copywriting and a new temple to shoes and design in their Vancouver HQ in the historic Gastown district which made of glass covering between two brick buildings. In Sarah Needleman‘s March 15th article Entrepreneurs Question Value of Social Media – several of the interviewees were experiencing the results they sought from social marketing as reflected in the subtitle: Marketing via Facebook, Twitter Yields Results for Some, Others Say It’s Overrated; ‘Hype Right Now Exceeds the Reality’. 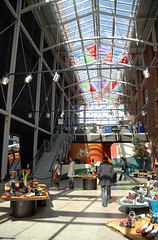 However, Stephen Bailey shared some growth figures and related tactics Fluevog uses to drive traffic and conversions. 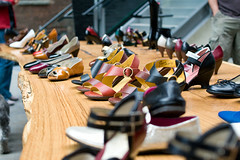 Here’s a snippet the article – and whether you are into SMB marketing or leather footwear, consider following @fluevog. Some entrepreneurs say they’ve found early indicators that their social-media efforts are paying off. “The people coming from social media have been buying,” says Stephen Bailey, who oversees social-media and other marketing initiatives for John Fluevog Boots & Shoes Ltd., a footwear and accessories retailer in Vancouver with about 100 employees. As evidence, Mr. Bailey points to a 40% increase in online sales in 2009—the first full year the company engaged consistently in social-media marketing—compared with 2008 when it was just getting started. He says he can draw a correlation between those figures and social media by looking at traffic to the company’s Web site from Twitter using Hootsuite, a free Twitter-management service from Invoke Media Inc. Other free services that track Web traffic from social-media sites include Google Analytics, CoTweet and Lodgy. “The second we started using social media, it became one of the biggest drivers of traffic outside of search engines,” says Mr. Bailey, adding that his research shows these visitors spend as much time on Fluevog.com as those who come from other online destinations. The company doesn’t invest in paid advertising on social media, he adds.